You may have seen women attending mass wearing head coverings, hijab like head scarfs, or even shawls pulled up and over their heads. This may have confused you a little, and left you wondering why they were attending a Catholic mass service. These woman are still Catholics, or to the lesser extent, one of the many Christian dominations that still follow the old tradition where women would cover their heads while praying or prophesying. 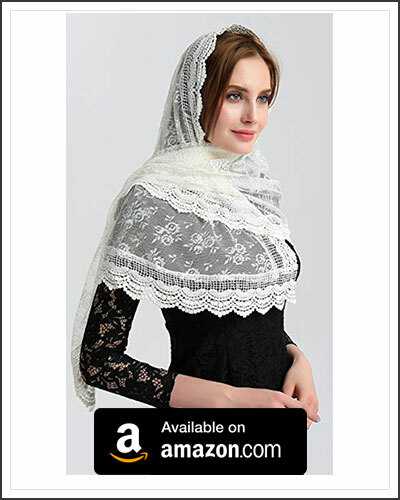 Hijabs and other head covers aren’t just something that is practiced in Islam or Judaism, up until the latter part of the 19th century, the wearing of a Mantilla was also practiced by the mainstream Christianity. Today, it is a personal choice for most western believers. Even so, it is still followed by many Orthodox Sects, Eastern European faiths, and even Anabaptist Christians – such as the Amish and Mennonites. 2 Why Did Mantillas Fall Out of Favor in Western Christianity? In the bible there are several verses that can be found that support the need for women to wear a head covering while praying or prophesying. In the early days of Christianity, these verse inspired Christians to have the women cover their heads in some form or another when a tending church. We need to be clear here that the following verses are open to interpretations. No where in the Old Testament, nor the New Testament does it explicitly state that cloth must be worn to cover women’s heads when praying or prophesying. The Old Testament makes several references to women wearing veils and binding their hair, but does not explicitly state that they are mandatory. After the priest has had the woman stand before the Lord, he shall loosen her hair and place in her hands the reminder-offering, the grain offering for jealousy,while he himself holds the bitter water that brings a curse. In the new testament, a woman is instructed to dress modestly, and respectfully of the lord and her husband. While Paul does state that every woman who prayers or prophesies should cover their heads, he does not say with what exactly. A woman’s hair is her glory and to not cover her head amounts to her being shaved bald. 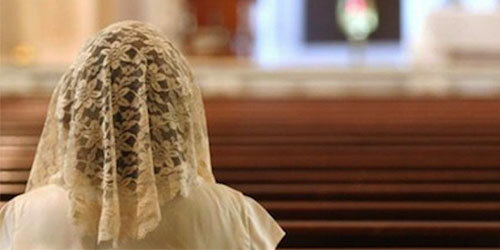 So should her hair be concealed under a veil? Or bound and contained in a neat and respectful hair style? But I want you to realize that the head of every man is Christ, and the head of the woman is man, and the head of Christ is God. Every man who prays or prophesies with his head covered dishonors his head. But every woman who prays or prophesies with her head uncovered dishonors her head—it is the same as having her head shaved. For if a woman does not cover her head, she might as well have her hair cut off; but if it is a disgrace for a woman to have her hair cut off or her head shaved, then she should cover her head. Some Christian dominations have taken the meaning of these verses quite literally, and require women to cover their heads as a symbol of reverence to God’s will. It is believed that wearing a mantilla signifies ones own humility, modesty and spiritual submission to God and even their husbands. Anabaptist Christians, such as the Amish, believe that Christians are commanded to pray without ceasing, even during all manner of daily activities. As such, they believe that women should have the back of their heads covered with a Kapps at all times. Many Eastern European Dominations such as the Russian Orthodox Church, still practice the tradition of having all female members, young and old, cover their heads with either scarfs, mantillas, handkerchiefs or shawls. Why Did Mantillas Fall Out of Favor in Western Christianity? The Woman’s Rights Movement of the late 19th century brought about many changes for female equality. Though this movement is not directly responsible for the change in tradition regarding mantillas, it did lead the way for women to assess every aspect of their lives, with more and more women moving away from what they viewed as oppressive traditions. The issue many of these women had with the use of mantillas, was similar to the view many people have today with regards to hijabs and burkas, in that they believed they were oppressive, and symbolic of male dominance over women. As cultures change and evolve, so to does the church. Today most western Catholics and Christians either chose not to wear mantillas, or are completely unaware of their existence within Christian faith. Others make the choice for themselves, and willingly wear the mantillas as a symbol of their own devotion to the Lord and the Church. 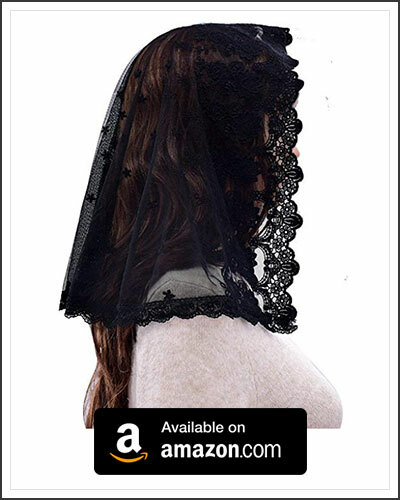 In western Catholicism and Christianity, the mantilla is now regarded as private devotion, and is no longer regarded as a symbol of women being forced to submit to their husband’s will. Should you wish to reconnect with old traditions and take to wearing head coverings during mass, or public prayers, there are several styles of head covering and mantillas that you can choose from. Here are a few such styles that can be found in different colors of lace. Should you find a style that best suits your taste, you don’t need to limit yourself to just lace. Try having a look for one that is made from a fabric or color that best suits your needs. Remember, wearing a mantilla or other head covering is your choice, and is your own personal devotion, so pick one that appeals to yourself more then anything else. A small handkerchief like covering. These mantilla are light, and designed to be draped over the top of your head. These large scarfs can be slung over your shoulders, or wrapped around your neck when not in use. Simply pull the up and over your head as you enter church or before you start your prayers. This type of scarf loops back on itself, there is no beginning or end to them. When not in use, they can be hung around your neck, and simply pulled up like a hoodie when you want to cover your head. 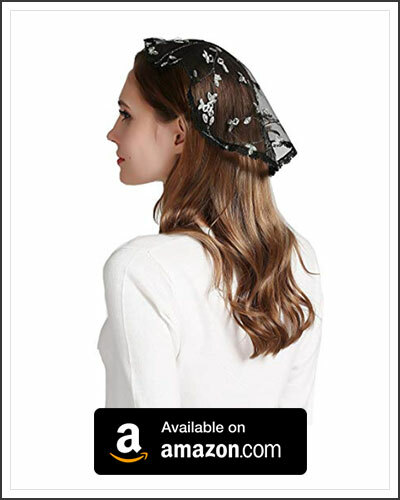 An elegant yet subtle headband that allows you to wear your mantilla without people noticing that you are wearing one. 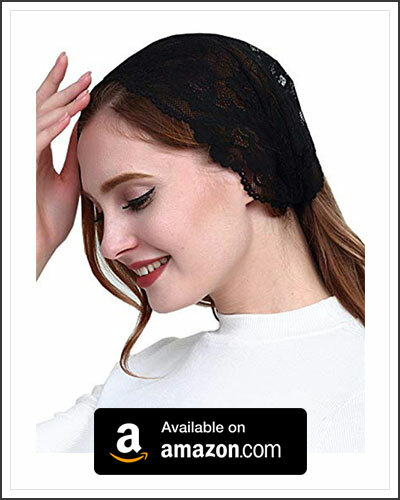 This makes it easy and convenient for you to wear your mantilla all day long, without having to worry about it being an inconvenience. A small and delicate mantilla that is held in place with pins. 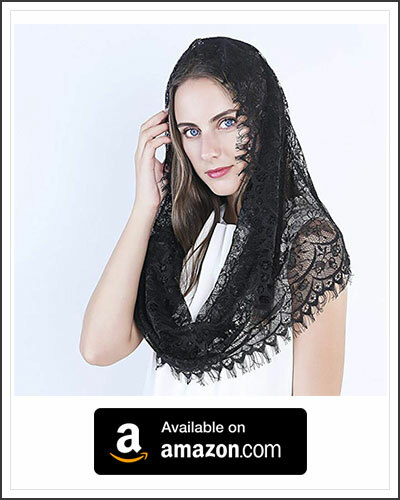 Being very light and small in size allows you to easily carry this mantilla around with you. You don’t have to limit yourself to a one tone mantilla. 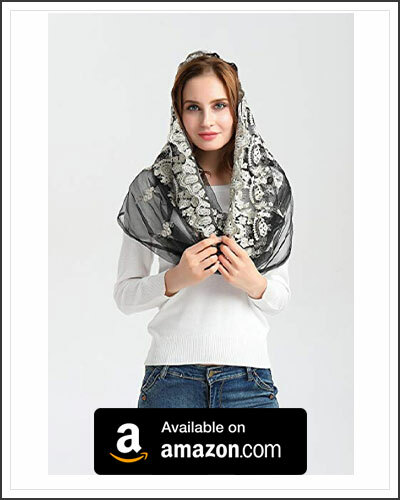 Should you want to, you can have a mantilla that has different colors and patterns. This can make the mantilla eye catching and an excellent accessory for your ensemble.